Jane Downes is a personal trainer & health and fitness coach who has found success for herself & her clients using a keto based lifestyle. 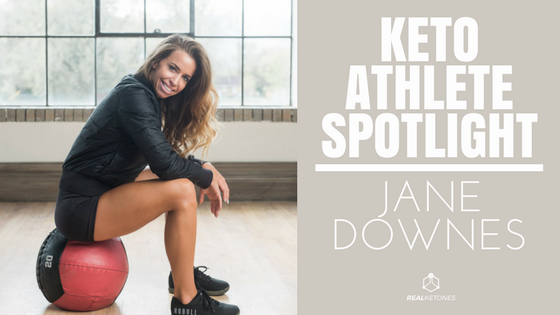 Jane Downes, of FitKetoGirls, is a personal trainer and health and fitness coach, who has found success, not only for herself, but also for her clients, in a ketogenic based lifestyle. Jane, along with her FitKetoGirls partner, Liz Williams, have created a community, filled with positivity, support, and love. They have developed different programs, both fitness and nutrition based, to guide you along your keto journey. You can check those out HERE. How long have you been following the keto diet, and what led to your decision to start? I have been following some version of the ketogenic diet (traditional ketogenic diet, targeting ketogenic diet, or cyclical ketogenic diets) for over two years. I made the switch to this lifestyle because I was looking for an alternative treatment for my depression and anxiety. What advice would you give someone just beginning the keto diet? I would suggest that you track your macronutrients and focus on eating whole real foods. I think lots of people make the mistake of eating lots of processed low carb foods and wonder why they don’t feel good and are not seeing results. Focus on eating foods without an ingredient list and track your intake to learn how best to formulate the diet for your lifestyle. I don’t suggest tracking long term but it is a great tool in the beginning. I have a crazy sweet tooth. Chocolate is usually what I crave most. How has the keto diet affected your athletic performance? During the adaptation phase my performance suffered. While following a strict ketogenic diet my performance slowly started to improve over time, but it was not until I started to play around with targeted ketogenic dieting and adding timed carbs back into my nutrition that I started to feel really strong again. What does a typical day of eating look like for you on the keto diet? Meal 1: Fat Coffee: mct oil, ghee, collagen peptides. Have you always been an athlete? Did you play sports in high school? I was a dancer in high school, but never lifted weights until after college. I fell in love with fitness and training because it helps me so much mentally. What does your fitness regime usually consist of? Right now I am not following any strict program like I have in the past. I do Crossfit 3-4 times a week, yoga 1-2 times a week, and 2-3 days of hypertrophy style workouts. What made you decide to move to Costa Rica? I visited Costa Rica last January and fell in love with the country and it’s culture. During my vacation, I experienced a joy in the people that I rarely saw in the US. It appeared that they lived a simpler and more soulful life. They truly live “Pura Vida”. I made the decision to move here in hopes to adopt a similar lifestyle for myself. What do you love most about the keto diet? I love that I feel my best both physically and mentally on the ketogenic diet. I also never feel deprived because I am always eating flavorful delicious foods. Do you use exogenous ketones? If so, what do you use them for? Yes, I have used exogenous ketones off and on throughout the last two years. I find them very helpful for mental clarity, energy, and satiety while I am fasting. For the full article on Jane Downes, click here!